Wow, this is a new record! Three posts on the same day! Studying for finals is not my favorite thing to do so in my attempt to procrastinate, I'm preparing more blog entries to share with you all :) I need more ideas! Please comment to tell me what else you guys would be interested in seeing on this blog! Thanks! 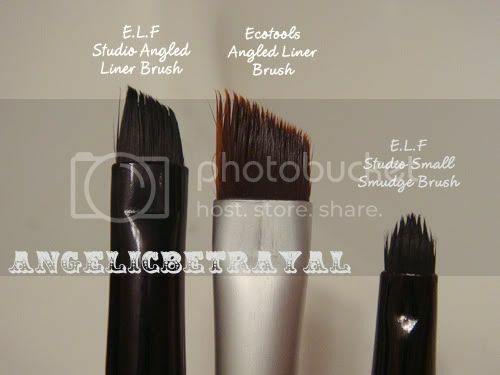 The E.L.F Studio Smudge Brush seems like it should be used to smudge out liner or color but I use it to apply my gel and cream eyeliners instead. I find that the brush is too small and stiff to smudge colors easily. Although this does not look like a typical eyeliner brush, the small brush tip is great for applying an even, thin line and for winging out my liner. This only costs $3 and you can get it for cheaper since E.L.F has frequent coupon codes. The Ecotools Angled Liner Brush came in a set with four other brushes for about $10 and you can find these brushes at Target, Rite Aid, Duane Reade, and Walgreens I believe. I love love love Ecotools brushes and have to get more! I used to use this brush religiously with my Wet n' Wild gel eyeliner but that stuff was super hard to remove and it started to fray the bristles. I use this brush predominantly for setting and smudging pencil eyeliner and to line my lower lashline with eyeshadow. The bristles on this brush are super soft and I really love this brush. Here is a side view so you can see the thickness of the brushes. The Ecotools brush is super thin so it really is great for making lines :) Although the E.L.F Smudge Brush may look thick, you will only really need to use the very tip so it still is pretty thin. I really like these brushes and by the end of the week, each and every one is quite dirty so sometimes I have to wash these before the end of the week :( I plan on getting the Sonia Kashuk Bent Liner brush which people say is great for gel liner since it is still affordable at only about $6. 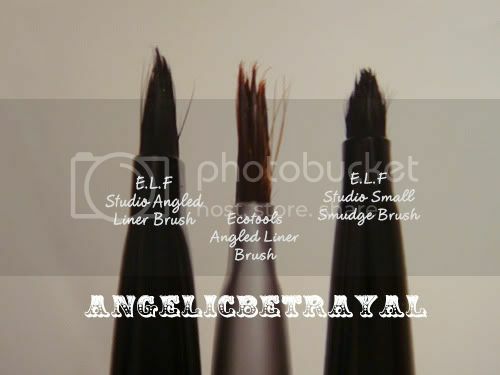 I used to use the E.L.F $1 concealer brush for my gel eyeliner and to set my pencil liner but it got ruined after I used it to mix up my Wet n' Wild liner which was drying out. I might pick that brush up again since it is only $1 and it comes in handy. I've been trying to find a brush that's really thin ^^ I'll consider these! I decided that using gel and liquid liners - although the result is always fantastic - is very time consuming and just a lot of work! Especially when the products dries up quickly! I might invest in a pen-form liner though... maybe that'll make a difference. Ashley: Ooh! Thanks for that :D I was going to pick up the bent eyeliner brush a few months ago but I put it back down because I was trying to control my spending >.< I'll get it on my next trip to Target though!